Forest County was created out of territory taken from Oconto and Langlade counties, in the spring of 1885. The county seat was fixed by the creative act on Section 29, Town 36, Range 13 East, where Crandon now is. There was no Crandon when the act went into effect. Section 29 was then an unbroken forest of heavy hardwood, of which not a stick had been cut, except out of a short bit of so-called road, cut through from Antigo and terminating near where the present Forest County court house stands. At that time the only railroad in the county was the Milwaukee Lake Shore & Western, which skirted the county along its extreme western edge and whose management had located the stations at Pelican, Monico, Gagen, and Three Lakes. At each of these stations a few people had settled, but simply a handful, probably not over one hundred in the four places. The only other settlement in Forest County at the time of it's creation, was around lake Metonga. Most of these early settlers had come over the military road running up into northern Michigan through Shawano and passing within a couple of miles of Lake Metonga - west of it. The people around the lake had secured the establishment of a post office called Ayr, in honor of the birth place of the poet Robert Burns of Scotland, and two mails each week were delivered at this post office. The mail route was from Pelican to Frydenlund (near Rice's place), thence to Ayr, over the same route. The distance from Ayr to Pelican was 22 miles, and long miles at that. The early passengers who rode over that road in the old three-seated buckboard that carried the mail bag can feel their teeth chatter yet. The road from Pelican to Wolf River, except a little stretch along the east shore of Pelican Lake, was literally paved with rocks. These rocks were very diversified as to shape and size, but they were quite uniform as to hardness, especially when they came in contact with the wheel-tire. After a short drive over that part of the road, the passengers to rest themselves, usually got out and walked the rest of the way to Wolf River. Sometime they walked clear through to Ayr ahead of the stage, and then the had to hunt up the stage driver and pay their fare. They knew he was having a hard struggle for life and wanted to keep him going. Those were the times for the "simple life" without any romantic annex. The pioneers were all on a level, so far as money is concerned, they were all poor, but independent. A frame house in those days was a luxury not to be thought of. A log house was good enough with the spaces between the logs filled with moss, mud or mortar; but mortar bordered on aristocracy in those days, as lime was so very expensive by the time it got to the pos office at Ayr. With the creation of the new county and the establishment of the county seat near the Ayr settlement, there came a sudden change. Strangers came in from different parts of the country in great numbers, to look over the county, and quite a few of them decided to locate here. The first county board met in a little log school house at the foot of Lake Avenue on the shore of Metonga lake, and did quite a stroke of business. 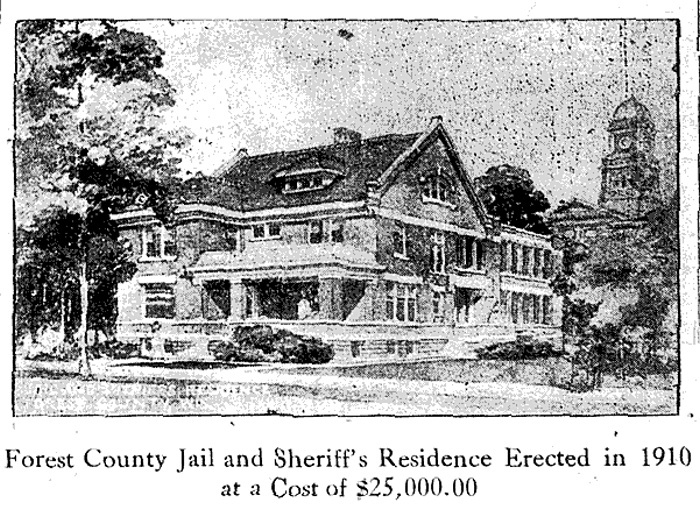 It purchased the present court house park, procured books for several officers, arranged for getting records from Oconto county, and went at it in earnest to develop a better road from the railway at Pelican. This board consisted of P. Shay, S.B. Roberts and C.C. DeLong; Mr. Shay being the chairman and Mr. DeLong clerk. The county officers were appointed by Governor Jerry Rusk and the list was as follows: County Clerk, C.C. DeLong; county treasurer, L. Motzfeldt; sheriff, Jas. Beulen; register of deeds, Henry Poppy; district attorney, Egbert Wyman; superintendent of schools, Louise W. Shaw; county judge, B. Darling; county surveyor, W. Burgess; coroner, A.J. Beaudette. The county board failed to agree on building a court house; but made a contract with Samuel Shaw for him to put up the building now occupied by Pooler's barber shop and rent to the county, for use of its officers, the front room of the lower floor. When the contract was entered into, no plat of the village had been made, and the forest stood in all its unbroken primeval splendor, without a building anywhere to mar the harmony of nature. Soon after this, however, the original plat was staked out into lots, and the new village was christened Crandon, in honor of Major Frank P. Crandon, tax commissioner of the C.&N.W. Railway Company, who had ably supported the creation of the new county from the very inception of the idea, and had stood by Samuel Shaw, the originator of the bill, through all its hazardous experience before a hostile legislature; doubly so, because of an antagonistic local member of the assembly. Lots in Crandon sold quite readily, but at small figures. The lot where the Page Mercantile Company store now stands completely filling it, was sold to Louise W. Shaw for $15; within a year she sold it for $150. It is now worth $2,000 without a building. The Park Hotel corner lot sold for $15 and the inside lot for $10. The whole block east of the Park Hotel, containing eight lots, 66X124 feet with 16 foot alley in rear, sold for $100. At that time the lands on the west side of Lake Avenue were not platted, the title being in dispute. Farming lands near Crandon in those days were selling on a slow market for $2 per acre, and lands in the Pestigo valley were valued at 50 cents an acre. Glen Park farm, the Hemlocks, Alfred Smith's farm, Charles Walrath's, Fasbinder's, Wilcox's. Baker's and many other farms have been developed from the $2 land near Crandon; whilst Rock Rapids, A.E. Himley's farm, Whybrew's, Robert's and a lot of other fine farms in North Crandon have come up out of the 50 cent lands. A small bunch of money in those days went a long ways in lands; they were so cheap, that people, except a few with strong faith, considered them worthless and would not even look at or consider them. The man who had an eye for the future was the exception; he was called a dreamer. "Why," said one, "you can never raise anything up hear but grass and that is liable to winter-kill." "That 50 cent land in the Pestigo valley." chimed in another, "is no good; they have frosts down there every month in the year." If the prophet ventured to suggest that clearing up the country would keep the frost out, "Pshaw," was the rejoinder, you are too near the north pole to ever think of making a farming country of this." If the speaker ventured to suggest the great value of the hardwood timber near Crandon, he was often met with this statement: "There is so much of that stuff all over the country, that this generation will not live to see your hardwood here manufactured." Or this was the reply: "Do you call this hardwood good for much? I don't; it's too small, and too rough. Oh, it might do for some little plant that uses bolts, something like a heading plant, but that's all." Does this kind of talk seem foolish to the reader? It probably does in the light of present history; but it was quite common, even up to year 1900, when everybody knew the railway was a certainty for Crandon. And this kind of talk heard in public places accounts in a large measure for the small real estate holdings, of many of the early settlers of the county. They were simply scared out of buying anything of any consequence, until prices had taken such a leap that they could no longer reach the new figures. Of course Crandon had a hard pull for many years after the formation of the county. Without any railroad to handle the timber, it was impossible to develop the country. The farms were small, the settlers few. Monico, then a thriving village with good backing made a dash for the county seat, but was too slow for the people who stuck by Crandon. A few years later, Three Lakes, at that time the largest and most prosperous village in the county, put up a hard fight to capture the county seat, but the effort was foiled by an injunction permanently granted by the circuit court on the grounds that the petition was not signed by a sufficient number of legal voters. When the train came rolling in, in the early days of 1901, Crandon's trials and vexations of spirit were largely over and the county seat entered upon a career of prosperity and solid growth which has attracted the attention of the whole state. Today it stands second to none in crops, climate, and natural beauty.